Cinque Ports jam pot - 6" (152 mm) high. 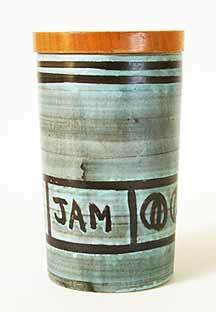 David Sharp left Rye Pottery in 1956 and formed Rye Art Pottery with his friend George Gray. The name had to be changed, though, when Rye Pottery threatened legal action. They asserted, probably quite correctly, that customers would be confused by the similarity of the two names and not know whom they were buying from. Consequently Rye Art Pottery became Cinque Port Pottery. The business was successful. George was the businessman and David the artist, and their combined talents produced a thriving company. In 1958, after the closure of Dicker Pottery, they bought the trade mark. They didn't use it, but more to the point, neither did anyone else. By the start of the sixties they were using four kilns and employing 15 workers. The partnership became a Limited Company, with another small change of name. They became Cinque Ports Pottery Ltd. The plural 'Ports' was used because that is what most people called them, being more familiar with Cinque Ports as a collection of towns rather than a particular constituent part of the collection. Despite the success of the company, George's businesslike inclinations didn't match David's artistic and unconventional temperament, and in 1964 they agreed to part company. David helped to acquire new premises for George, and stayed himself at the existing Cinque Ports Pottery premises at The Mint. The two men stayed good friends for the rest of their lives. George, who retained the Cinque Ports name, settled into his new premises, The Monastery, and started doing the things he found impossible when working with David. He made domestic wares that would sell in quantity, along the lines that Rye Pottery were using. George bought a small pottery in Stoke on Trent to supply biscuit ware to Cinque Ports; space was limited in The Monastery and he thought this would solve the problem. The venture was not a success, though, due to transportation problems. The business expanded and was successful into the eighties, by which time George was growing old. He had other business interests - a restaurant, and later a gift shop - and decided that it was time to hand the pottery over to a younger man. Jim Elliot took over, trading as Cinque Ports Pottery, without the 'Limited', and later Cinque Ports Ltd, without the 'Pottery'. The pottery closed in July 2007.